Every summer there comes a time when reasons for my annual burst of excitement is all too obvious. 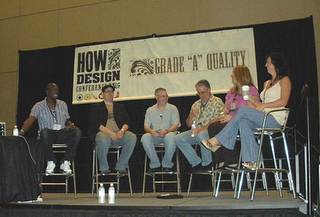 The HOW Design Conference approaches and I reach near giddy status in anticipation of meeting up with thousands of creative types like myself. Consider this: I never went to summer camp so this is my 12 year old self, packing and readying myself for a summer camp full of old friends and new faces. 'Meatballs', anyone? This year's edition of the "HOW" was in the creative haven of Austin TX. No better place could have been chosen as it supported a very loose, indie, devil-may-care vibe that lies at the heart of many a creative person. The heat was record status, but that's not saying much for Texas in June, where 103º is no record temp. The food was incredible all week long. And the "weird" was definitely brought with force. For the past few years I've been a member of the advisory committee for the conference and the last two years I've been fortunate enough to have presented and facilitated the Networking Lunch. So I've been involved on a different level, which may explain my passion for the HOW conference and my love for the staff. But this year there was more… I was "honorary staff"! Little did I truly know what that meant. The involvement went even deeper, more scheduled that even an attendee, and really pretty tiring. But also with that, deepened my appreciation and my feelings of why this is so important to me. I've seen the conference from the perspective of attendee, speaker and now staff. Nothing has dulled my view of what HOW means to me and so many others just the same. Some get jaded or the newness and excitement wear's off. Understandable. But for others, the vibe grows in importance and meaning. Just like summer camp. So after introducing speakers and conducting on-the-street interviews, I was once again asked to speak on a panel with some amazingly sharp minds, a few of whom also happened to be very good friends. Jeni Herberger, Daniel Schutzsmith, Jeff Fisher, Andy Epstein, Megan Slabinski and myself held an early-bird special session to talk about some of the issues facing creative professionals of every type. To our surprise there were actually people in the seats that early! More over, they had to kick us out of the room because people stayed for hours after, talking things over and really taking the conversational art to heart. Have I told you why I love the conference so much? It's just that: the ability to connect and share for 4 days in a delightfully captive environment. I wasn't able to attend many sessions due to working the conference this year, but lots of good things were heard about many a speaker. Von Glitschka, Daniel Schutzsmith, Mark O'Brien, Mark Randall and Andy Epstein are a few of the people you should look up because their info will be available and it was very well received. And now we've come to the candy-coated goodness of it all… Yes, there was the now famous themed end-of-the-conference party, hosted by Neehah Paper and HOW. This year's theme of "Keep Austin Weird" was taken to heart by many, myself included and if you caught sight of my gold crown, golden "Elvis" shades and golden shoes, you know I was all in! In all, another great conference and the excitement for the next has started to mount already. My thanks and love to the HOW staff. Bryn, Heather, Beth, Lynn, Barb, Alicia, Amy, Megan and Sara; You all are so amazing and I've always respected and appreciated what you've done for me and others, but I now have a new-found respect for what it is you truly do and pull off without asking for extra thanks or adulation. Well I'll loft up all the extra I can because you deserve it. And to the many others I met and chilled and conversed with last week; Props and all the best to you, colleagues and new friends. You've made this year as good or better than any other.